The chapter describes the challenges of tropical weather forecasting. We examine types of observations and weather analysis techniques used by tropical forecasters. Those analysis tools are applied to examples of tropical synoptic weather systems as well as mesoscale analysis and nowcasting. 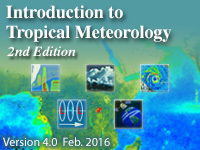 The last three sections focus on numerical weather prediction (NWP) including: the fundamentals, data assimilation, comparisons of statistical and dynamical models, ensemble techniques, cumulus convection in NWP, tropical cyclone prediction, and methods of forecast verification and validation. We have special focus sections on Australian-Indonesia Monsoon weather and interviews with forecasters from the National Hurricane Center (audio in English and Spanish), and Tropical Cyclone Centre Météo-France/La Réunion (text in English and French). Excellent information- I learned a lot, but did have to use some outside resources for clarification on rossby waves. Then again- I have not taken any formal meteorology classes- I study this material informally as a weather hobbyist and storm chaser.